Graduation is a special time for students and their families. Live events such as school convocations and the commencement exercises are very important rites of the academic community. Unfortunately, not everyone will be able to attend. Geographical distance, limited seating, mobility issues, and unfavorable weather can prevent some students’ loved ones from attending. Boston University wanted to make sure that everyone would be able to witness these important academic events. How could they extend an invitation beyond the confines of the physical campus? Boston University is a leading private research university, with over 33,000 undergraduate and graduate students from more than 130 countries. BU’s three campuses house 17 schools and colleges, offering 250 fields of study. The university is run by nearly 10,000 faculty and staff and is one of the largest employers in the City of Boston. Founded in 1839, the school has produced multiple Nobel Laureates, Academy Award winners, Pulitzer Prize winners, governors, inventors, athletes, and notable scholars in many fields. Boston University has always taken pride in its educational mission and set a strategic goal to achieve a fully integrated and interconnected institution, as first laid out in the One BU philosophy guide. One of the successful implementations to work towards this goal was the establishment of a One BU, institution-wide live video streaming platform. Back in 2015, there were six separate video platforms that were deployed at various schools and colleges; all of these diverse platforms provided content management and streaming capabilities at different levels of sophistication and reliability. As one would expect, this plurality of platforms caused difficulties in providing adequate support to departments and members of the Boston University community. The multiple deployed platforms not only caused confusion and considerable cost, but also created major inconsistencies in technology and the quality of video. A team of experts set out to lay the groundwork for a centrally supported video streaming service, able to meet the requirements of Boston University in the One BU model. Their goal was to identify a solution that empowered streaming media to become a staple of teaching and learning. The Kaltura platform, branded at BU as as MyMedia, allows Boston University’s schools, colleges, and departments to incorporate streaming media into the curriculum and extend their reach to new audiences. Live-streaming events, which is an integral part of Kaltura, is an example of the successful collaboration between Kaltura and Boston University. Learning & Event Technology Services, also known as LETS, in Information Services & Technology, provides and supports the university community’s AV/IT needs for event streaming. Prior to Kaltura, LETS worked with a provider that only allowed for a single live-stream. Thanks to Kaltura (LETS-Stream) such limitations no longer apply. Since offering the live-streaming service in 2017, LETS has been streaming as many as twelve independent events simultaneously. 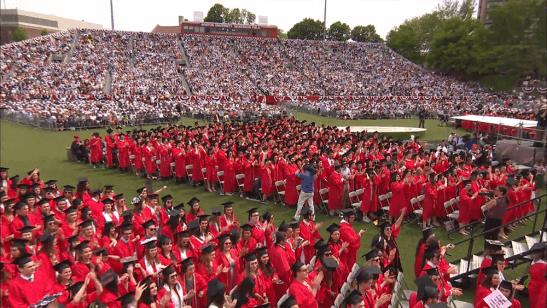 Streaming video at Boston University hit a milestone when LETS streamed one of the most exciting commencements ever held at the university. The momentous event: Red Sox baseball slugger David Ortiz receiving an honorary degree from the university in 2017. 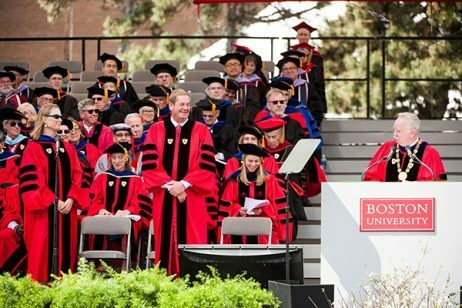 Boston University’s Commencement Exercises were streamed live, to over 5,000 viewers in over 80 countries around the globe. Furthermore, the Kaltura platform successfully addressed the need to live-stream multiple concurrent school or college convocations and enabled the university to extend the experience of these events to family members who were unable to attend in person. With the past commencement and convocations in May 2018, the number of viewers further increased. "We did a lot of testing as far as bandwidth and equipment went, prior to commencement weekend, and it really paid off. From my experience, being able to view live analytics as you’re streaming is super helpful, and the clients really enjoyed getting that information." Kaltura has made a strong and positive impact on Boston University. The platform has allowed the university to provide a highly reliable video streaming service and repository to its community. Across the institution the service has facilitated a wider audience being able to take advantage of streaming media and live-streaming. Faculty, students, staff, and all members associated with Boston University now have greater access to the outstanding instructional content and experiences that are being created at Boston University. With the help of Kaltura, Boston University has been able to realize the One BU philosophy in the area of video streaming. Adding the capability to stream on demand, to live-stream, and to distribute media around the world supports Boston University in its mission of educating students to be reflective, resourceful individuals ready to live, adapt, and lead in an interconnected world.